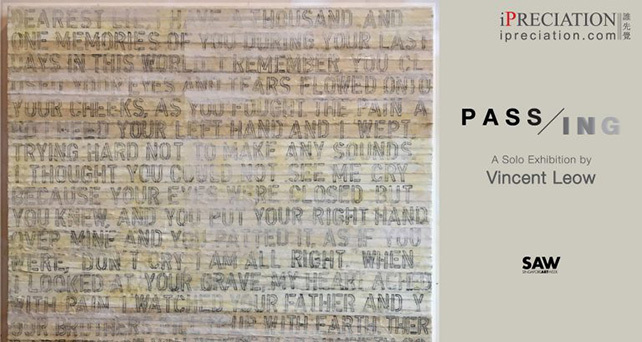 iPRECIATION is proud to present a solo exhibition by Singapore artist Vincent Leow, entitled Passing. This exhibition showcases twenty-five works by Leow from 2007 to 2018, featuring paintings, mixed media and a sculptural work. Leow considers the impermanence of life through the passage of time, and explores the sentiment of losing something or someone. Leow’s works are informed by the cultural and social issues around him. From 2008 to 2013, Leow taught Painting at the University of Sharjah, United Arab Emirates (UAE), and his works created during this period of time reveal many influences from the region. His series of silhouette portraits allude to censorship in the UAE, while works featuring superimposed layers of animals and people speak of the political crises that have confronted the Arab world. Since Leow’s return to Singapore, his works look to historical issues closer to home, such as the “Merdeka” battle cry used in Singapore, Malaysia and Indonesia calling for freedom, anti-colonialism and independence in the 1950s. Yet, Leow continues to create works based on news of loss in the Arab region.